Despite predictions of rain, the day in Vermont turned out to be partly sunny, and PLENTY humid. That made for some dusty and tacky conditions, depending where you were on the course. After another week off the bike to go to Vegas, I was raring to go on Saturday. Unfortunately, I didn’t get my act together in time to pre-ride the course, so opted to do my complete warmup on the trainer, and see what was in store for me later (I did get some good course intel from other racers). A second row start wasn’t bad as I was quickly able to pass a number of people headed up the grass and onto what turned out to be my type of course. I knew it would be [relatively] short – only 30 mins, so I went into the red zone, and pushed as hard as I could, treating the race just like a TT. At the end of the first lap, I was sitting in 7th place behind Blake and Christina from MRC/Landry’s. I managed to pass both of them going into the second lap, and pushed to try and stay ahead. Unfortunately, I made a tactical error thinking I could ride the stairs (yes, I tried it in a race situation first! ), and lost some time when I was forced to dismount. Christina ended up pinching me out in the corner approaching the BMX uphill, and then couldn’t follow through over the hill, forcing me to stop and dismount! That set me off, and I chased, but was never able to catch back on. 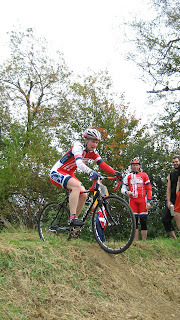 I did lose another place to Silke Wunderwald who was doing her first ever cross race (FWIW, she finished 7th in the W1/2 field at Fitchburg this year)! The course suited her well also, as it wasn’t that technical. I ended up finishing in 7th place overall, but ahead of Blake ;). We spent the rest of the day watching many of our friends compete in the Men's 2/3 and Women's Elite fields, and then a number of us headed into downtown Burlington for a few beverages and some dinner. A fun way to end a great day of racing. Click here for more racing pics from Saturday (thanks to Steve L. for the photo on this page). Unlike the monsoon weather many of our teammates were facing in Bedford, Sunday in VT was again humid and started out foggy with a few sprinkles, but no heavy rain. The humidity and mist did cause the course to be wet, making the more technical course a little more slippery than the previous day. The course was different than the previous day – more technical in nature, but still long and with some good climbing. The changes today included a long slog up to a run-up with three logs across the hill, a section of singletrack in the woods with a bridge crossing, and a screaming fast downhill that put you into a VERY tight chicane that while rideable, was faster to run. We then crossed another bridge and came at the barriers in the opposite direction from the previous day. It was definitely more challenging than the previous day, but also more fun. I got a not great start off the line when Stacey M didn’t quite go on the whistle… Still managed to make up some places, and really moved up when I passed Leah and another racer who crashed in one of the first ruts on the course. The whole race for me was about catching the racer in front, which I managed to do a number of times. I even managed to catch and pass Silke at one point, but it was short-lived – she passed me back, I tried to get on her wheel, and she made me eat her dust. In the end, my race ended up being between myself and Mary F – one of my main MTB competitors this season (and overall winner of the Root 66 Sport Women’s series). Going into the final chicane, I was ahead of Mary by a small amount, and Luke Keough was about to lap us both. Luke held back knowing we were about to finish our race (a real class act, especially since he was miles ahead of his next competitor), and I started to sprint up the finish hill. Out of the corner of my eye, I saw Luke’s wheel, and then heard him say “C’mon, let’s sprint it out” as both he and Mary passed me by. At that point I didn’t have the legs to respond, and I ended up finishing 9th, one place behind Mary. The race Sunday hurt, and apparently the pain was evident as I crossed the finish line with nothing left in the tank. Overhear on the loudspeaker was Richard Fries announcing to everyone that I was finishing, wearing a “mask of pain” ;). Click here for more pics from Sunday.